My son Beppe turned 3 – Sunday. He has never watched Star wars but gets the whole thing anyway. He knows all the names and loves the swords. I used to to the Leia buns when I went to school and in 3rd grade the craziest boy in school interrupted class just to come and give me an ewok. Oh I was happy but so ashamed at the same time. When I found this book in New York I just had to buy it. 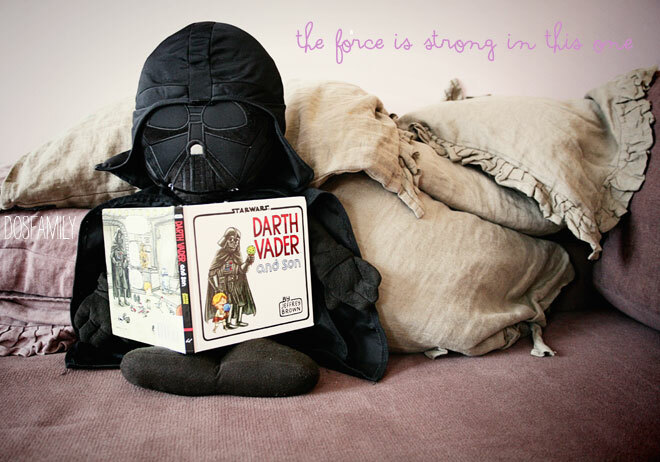 It’s called Darth Vader and son and is made by Jeffrey Brown. It’s simply fantastic and adorable and supercool! Beppe doesn’t get the irony of Vader being a normal dad but he wants me to tell him to clean up his room in a firm voice as Vader does to Luke. And we read it at bedtime both being happy abut seeing two different stories. On Chronicle books site you can (at the bottom of the page) download some gift tags and a poster etc. that jeffrey made to go with the book! How Sweet! Both the book and the Ewok gift! Thanks Catherine! I wrote wrong day- it was sunday… But thanks! Jag fullkomligt älskar boken! Den skulle passa min brorson perfekt. Lyckades du alltså få den skickad till Sverige? Eller köpte du den i USA? Ja verkligen habegär på denna Matilda- googla – tror den finns på adlibris! jag köpte den i en affär i NYC.! Wednesday: Newsy Snacks For Busy People | justb.